MBTA Transit Police officer Richard H. Donahue Jr.
Woburn neighbors of Richard H. Donohue Jr., the MBTA Transit Police officer critically wounded early Friday in a shoot-out with the Marathon bombing suspects, say the 33-year-old is athletic and a devoted father — attributes they hope will help him pull through his injuries. Donohue was in critical but stable condition Friday at Mount Auburn Hospital in Cambridge, with a single gunshot wound, the hospital said. “The fact that he is in good shape [athletically] is giving me hope that he would be all right,” said neighbor Linda Mawn, who lives down the street from the Donohue family. Authorities said Donohue was wounded during the shoot-out in Watertown, just hours after his friend and classmate from the 2010 MBTA police academy, MIT Officer Sean Collier, was killed Thursday night, also by the suspects. 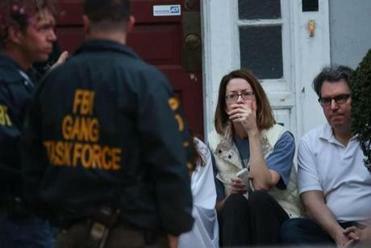 Onlookers applauded as Marathon bombing suspect Dzhokhar A. Tsarnaev, 19, was taken into custody after a two-hour standoff in Watertown. 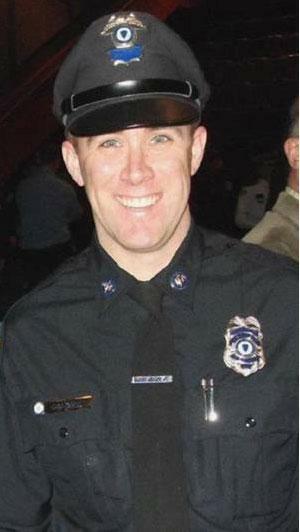 Milton Police Officer Michael Delaney, a classmate of Donohue and Collier at the police academy, declined an interview, saying officers in the 26-member class had decided not to speak about their friends, out of respect for their families. Donohue, a 2002 graduate of the Virginia Military Institute, grew up in Winchester and was known as an avid runner. His 1998 Winchester High School yearbook noted that the winter track team was “led by seniors, including the ravishing Richard Donohue.” He was also a member of the National Honor Society. Along the quiet dead-end street where he grew up, neighbors lined their yards with small American flags Friday in his honor. Richard A. Davey, the state’s secretary of transportation, and Beverly A. Scott, general manager of the T, spent Friday morning at Mount Auburn Hospital, waiting with the officer’s family for updates on his condition. Donohue has a 7-month-old son, Scott said. She said Donohue’s wife showed her a photo of the child, who has big blue eyes, surrounded by small chicks from Easter. “He has a beautiful family,” she said. Donohue’s mother is a nurse, Scott said. The two transportation officials said they did not have specific information about how Donohue sustained his injuries. The officer was not one to shrink from danger. In January, he received a commendation for dashing into a Chinatown T station during a stabbing and grabbing a sweatshirt to staunch profuse bleeding from the victim, who was taken to Tufts Medical Center, according to the MBTA commendation. A law enforcement official who knows Donohue described the officer as an exceedingly intelligent officer who knows how to handle tense situations with young people. Donohue and his wife, Kimberly, moved to Woburn about a year ago and dote on their son, Richie, said Mawn, the Woburn neighbor. “They love that baby to death,” she said. She said Donohue’s home was surrounded by police when she woke up early Friday — an unnerving sight, given the week’s events. Globe Staff writers Maria Cramer and Deirdre Fernandes contributed to this story. Kay Lazar can be reached at klazar@globe.com. Follow her on Twitter @GlobeKayLazar.